Reports of medical waste, including needles and blood sample test tubes, washing up on Jersey Shore beaches are raising concerns ahead of Memorial Day weekend. NBC 4 New York has learned of wash-ups on two Raritan Bay beaches, in Middletown and Perth Amboy. Sixteen-year-old Middletown North high school sophomore Lia Davido said she found several needles earlier this spring, then blood sample test tubes as well over the course of several visits. "It's my beach, and it's the beach for families all around here. They bring their children who are like two years old," Davido said. 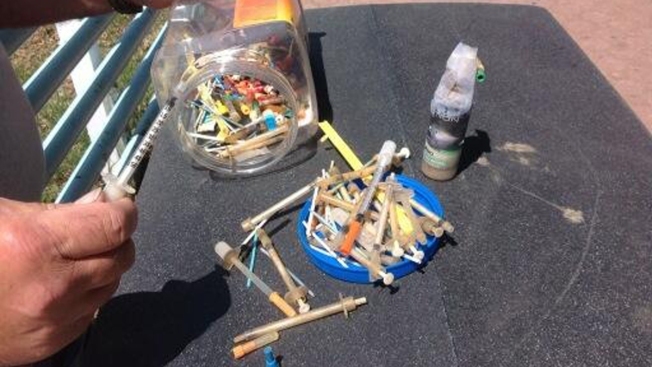 Just a few miles away, the riverkeeper said he had found dozens of syringes in late April and early May on a Perth Amboy beach at the mouth of the Raritan River. "I started having flashbacks to about 10, 12 years ago when we had medical waste washing up all over the Jersey beaches," said riverkeeper Bill Schultz. Schultz eventually notified the Middlesex County Health Department, which this week began sending a worker out to make periodic inspections for more waste. New Jersey Department of Environmental Protection spokesman Larry Ragonese said the problem appears to be isolated, probably caused by the heavy spring rains overwhelming the area's sewer systems. Ragonese said NBC 4 New York's inquiry prompted a brief check on the Atlantic beaches, and all the local health departments reported no issues. It is not clear who is responsible for these dumps, though some of the needles do have the word "insulin" stamped on them.